Erasure - I Say I Say I Say - Made in EU - w/ the hit track "Always"
PHILIPPINES:Universal CD Sampler,ERASURE,ELTON JOHN,DAN HILL,WORKSHY,SUGAR,RARE! 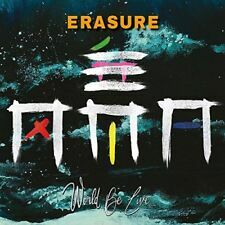 Erasure ‎– Always: The Very Best Of Erasure (Deluxe 3CD Set). Victim Of Love. Victim Of Love (Vixen Vitesse Remix). (Vince Clarke Sync 82 Remix). The Circus (Eternal Eraser Mix ). Blue Savannah (Der Deutsche Mix II). Erscheinungsdatum: 6. KonzerthöhepunkteVor gut einem Jahr veröffentlichten Erasure ihr 17. Studioalbum »World Be Gone«. Format: Doppel-CD. Audio CD (13. Juli 2018). World Be Gone (Single Mix). World Be Gone (Giant Mix By Gareth Jones). World Be Gone (Boxed in Remix). Oh What a World (GRN Remix). Oh What a World (Manhattan Clique Remix). OBI JAPAN Irrelevant sticker on the case. OBI STRIPE Located in Shimokitazawa, Tokyo, Japan. RATES FOR 1 CD. IMPORTANT NOTE. MIDDLE EAST. Countries and regions where underwriting suspension are occurring. Catalogue Number is: CDMUTE244. FREEDOM acoustic version. UK 2000 CD Single. ITEM CONDITION DETAILS/EXPLANATIONS ABOUT THE CONDITION GRADINGS DISC is mostly NearMINT, few light marks. "World Be Live" komplettiert die Alben-Trilogie, die 2017 mit der Veröffentlichung des 17. 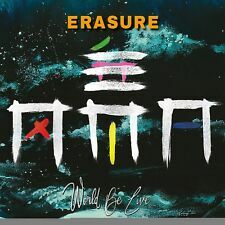 Erasure-Studioalbums "World Be Gone" begann und ihre Fortsetzung Anfang diesen Jahres mit "World Beyond" fand, einer Bearbeitung des "World Be Gone"-Originalmaterials durch das belgische Echo Collective. Erasure ‎ Am I Right?. / JAPAN CD Mute ALCB-430 The Grid Bob Kraushaar 1992. Item from Japan. Cover Jacket : A-. Erasure picture disc cd single of Chains of Love Mint Condition unplayed. Banjo – Lenny Westleigh Producer – Erasure Remix – Robert Gordon Written-By – Clarke/Bell 5:57. 1 Chains Of Love (The Foghorn Mix). Piano Song. Crown of Thorns. 2,000 Miles. Brother and Sister. Rara edición especial fans /Rare special fans edition. -Como nuevo, raros cds negros por la parte del audio, mira las fotos /Like new, rare black cds in the audio zone, look at the pictures. REST OF THE WORLD (USA, AUSTRALIA.). 03 World Be Gone. 01 Love You To The Sky Radio Mix. 01 Love You To The Sky. 03 Love You To The Sky Ladytron Remix. 04 Love You To The Sky Vince Clarke Remix. 05 Love You To The Sky Adam Turner Remix. 10 Just A Little Love. Erasure NIGHTBIRD (2005). This item is NEW/SEALED and is the official EMI Taiwan release. I used the exact item for taking the photos. Artist: Erasure. 1-10 Stayed a Little Late. Format: CD. Condition: New. Missing Information?. 1-5 Be the One. 1-7 Under the Wave. 2-4 Always. Erasure ‎– Nightbird 2001 CD Rare edition. Silver factory CD. Booklet 4 pages. Sweet Surrender. I Broke It All In Two. Mixed By – Mark Saunders, Vince Clarke. Because Our Love Is Real. We are not responsible for each country's custom clearance procedure and custom duties. Custom Duty. We are here to make you happy! Kiya Japan is founded in Tokyo, Japan in Aug 2012. Expedited: Per 1CD ⇒ USD 2.5. Hier folgende 2 CD / Here following 2 CD Pop international. Pop englischsprachig. Here I Go Impossible Again. World Be Gone. Victim Of Love. Love You to the Sky. Blue Savannah. Chains Of Love. Who Needs Love (Like That). ERASURE - WILD! (DELUXE EDITION) (2019 REMASTER) 2 CD NEUF. (DELUXE EDITION) (2019 REMASTER) 2 CD NEU. Hier folgende 2 CD / Here following 2 CD Pop international. Pop englischsprachig. Die Farben der Ansichtsbilder können geringfügig vom Originalfarbton abweichen. 1-4 Mad As We Are 3:57. 2-1 Who Needs Love (Like That) 3:09. 1-7 Chains Of Love 4:00. 1-5 Just A Little Love 3:37. Erasure - Pop! - The First 20 Hits CD - Very Good Condition. 16 Chorus 4:29. 2 Heavenly Action 3:20. 17 Love To Hate You 3:56. 19 Breath Of Life 3:55. 18 Am I Right?. 14 Blue Savannah 4:19. Erasure Vol. 3 Ultra-Rare Trax CD in VG Condition. ALWAYS / TRAGIC. RATES FOR 1 CD. IMPORTANT NOTE. MIDDLE EAST. Countries and regions where underwriting suspension are occurring. The item in the picture is the item you will receive. Title: FREEDOM [cat nbr PIAS MUTE 39 1244 22 ]. 1 FREEDOM 2.53. 3 FREEDOM acoustic version 3.15. This cd is unplayed and new and is housed in a new slim jewel case. FOR THIS CD! no extra costs ! We are specialized in collectable cds, and use our own scans to give as much as possible information. Be The One. Under The Wave. Chains Of Love (Live). Breathe (Live). Victim Of Love (Live). Always (Live). Heavenly Action (Live). Hideaway (Live). Chorus (Electronic Periodic Remix). (Andy Bell and JC Remix). A Little Respect (Avantara Remix). Catalogue number is: CDMUTE89. DRAMA act2. UK 1989 CD Single. 3" CD in a 5" CASE/PICTURE SLEEVE. IF YOU NEED FURTHER INFORMATION about anything else DETAILS/EXPLANATIONS ABOUT THE CONDITION GRADINGS.